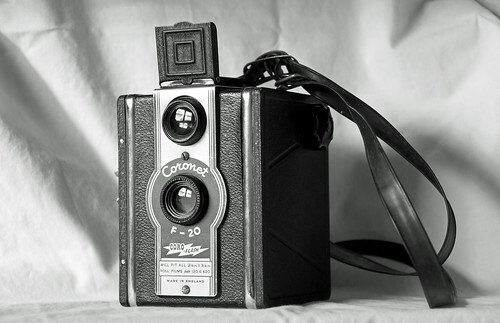 The F-20 Coro-Flash by Coronet is a simple camera for 6x6 cm exposures, but one which offers a few twists on the usual box camera. First, its centered viewfinder window and (small) folding hood give it a certain faux-TLR styling. Secondly, it was designed (and proudly labeled) to accept either 120 or 620 film sizes. Finally, it offers flash sync, for example when using its namesake Coro Flash flashgun. This page was last edited on 15 November 2018, at 07:53.